The Count PerfMaster Sprint 18" Perforating and Scoring Machine offers a self-fanning automatic bottom friction feed, which allows for continuous feeding without stopping, and a simple-to-use one button control. 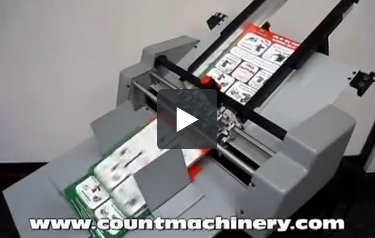 This machine feeds single sheets, coated stock or multi-part forms, open or glued edges. Simplicity and affordability all in one machine! Contact MyBinding today to learn how Count's PerfMaster Sprint 18" Perforating and Scoring Machine can improve production of perforating and scoring operation today. Removable receiving tray and side rails make for easy mobility and tabletop use. Quickly change from perforating to scoring in just seconds. 18" wide paper feed capacity. Easily set Perf/Score depth control. Magnetic paper stops on the receiving tray can be easily adjusted depending on the size of the paper. Optional support stand available for easy mobility. Side rails on the paper feed table are easily adjustable for various paper sizes. Red emergency stop switch for easy job cancellation. Thank you for your question. The Count PerfMaster Sprint 18" Perforating and Scoring Machine can do a maximum of 4 perfs per sheet. You have 5 different interchangeable perf wheel options, including 2 microperf options.